With the holidays approaching, we understand that sometimes you need a drink. Whether it be at a work holiday party, ugly sweater party, cookie swap, or just getting through time you are spending with your family, alcohol can help lubricate the process. We’ve compiled a list of cocktails to help get you by, as well as a few non-alcoholic drinks that are great for those pregnant or nursing or want to serve to children. 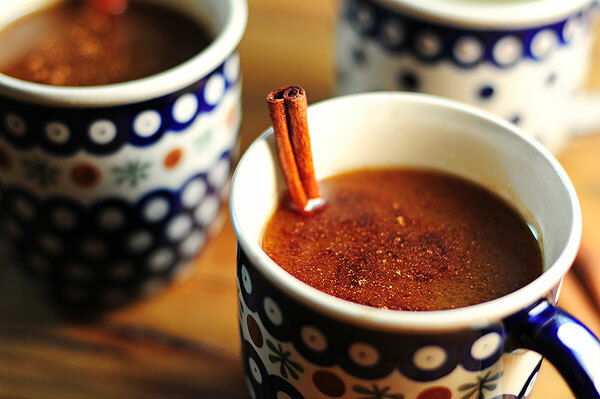 The Swiss call it glog, the Germans call is gluehwien; regardless, this warm, spiced wine is guaranteed to warm you up after coming in from the chilly temps. With as little as six ingredients (and adding brandy as an option), we really likeGimme Some Ovens’ Mulled Wine recipe. Ring in the yuletide spirit of the holidays with a fa-la-la latte. Made with all the holiday essentials of egg nog, sugar, coffee, nutmeg, cinnamon, amaretto, and the optional whipped cream topping, BackToHerRoots’ Amaretto Spiked Eggnog Latte will make your holidays merry and bright. If you need a dairy free option, there are a lot of dairy-free alternatives such as almond nog, soy nog, and coconut nog. Our cheeks are nice and rosy and comfy cozy are we thanks to She Wears Many Hats’ Hot Buttered Rum. Nothing says the holidays more like drinking something that has butter in it, Paula Deen would be proud. Besides, your diet starts next year, right? An adorably pink, fun whiskey drink that is a little healthy? It’s true! Pomegranates are vitamin power houses because they are rich in Vitamin C, B6 and potassium. We love Self Proclaimed Foodie’s Pomegranate Whiskey Sour. Cranberries are one of the few fruits native to North America. For most families, it’s a holiday staple. We love thatChef Savvy’s Holiday Cranberry Pomegranate Mojitos look like mistletoe in a glass- complete with a cranberry reduction, pomegranate juice, fresh lime, and mint. We’re dreaming of Freutcake’s Peppermint White Christmas cocktail. Hopefully Santa can help you find three simple ingredients of champagne, crème de menthe, and candy canes. Only you decide if you’re still on his good list after having a couple of these. Minty and creamy go together like holly and berries, or Aunt Carol’s homemade sweater and disappointment. We loveA Beautiful Mess’ Peppermint White Russian because it reminds us of liquid mint ice cream. Enjoy without the brain freeze! The Grinch and his hapless dog can’t take away your holiday cheer. Whether you’re celebrating the holidays in Whoville or Walla Walla, Washington, The Cookie Rookie’s Grinch-tini will turn a bitter grump into a heartfelt homebody. Sparkling water mixed with apple juice makes this typical holiday punch seem more like a champagne treat. By adding chopped pears, cranberries, and cinnamon to this holiday drink, The Coupon Challenge’s Virgin White Sangria is delicious and is still a safe call for the designated driver. Want to serve alcohol-free beverages to a group? Dessert Now, Dinner Later’s Crimson Christmas Punch is a great beverage to serve guests of all ages. With fruit punch, cranberry juice, pineapple juice, lemon juice, ginger ale, and raspberry sherbet pair well with Christmas Carols and yuletide greetings.